Increasingly, businesses are at the mercy of data availability and are exposed to severe data loss and prolonged downtime in the event of a disaster. As storage demand continues to grow, proper backup of that storage to an offsite location becomes a challenge, especially for small businesses and remote offices that may not have a dedicated IT staff. Setting up online backup can be daunting and the task can often be procrastinated and forgotten. That’s where ReadyNAS Replicate comes in. Your business already entrusts your most important data to the ReadyNAS. ReadyNAS Replicate simplifies the replication of that data to another ReadyNAS whether the two systems are on the same LAN or whether they’re a world apart. Simply set up the replication job and run the initial replication locally. Then move the second ReadyNAS anywhere with Internet access, and the replication continues, with no additional setup. As you can see, ReadyNAS Replicate is just one of many smart ways that the ReadyNAS simplifies your business storage needs. 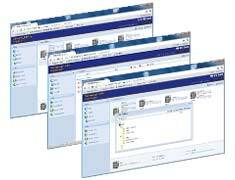 ReadyNAS Replicate allows users to implement multi-site backup jobs with an easy and standard approach. By automating the process and eliminating human errors, you can rest assure that your data is backed up and available for recovery needs. In addition, replication occurs using a snapshot of your data so that your transferred data is point-in-time consistent. This also allows the backup to continue even if the job exceeds your backup window without concern for the changing data. Hiring an IT staff to maintain your business storage in today’s economy can be a tough decision, but ensuring data recovery is something you cannot compromise. 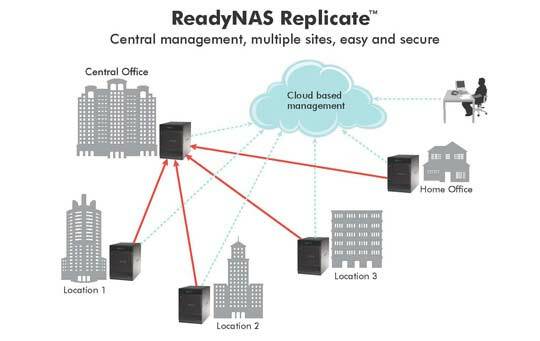 ReadyNAS Replicate gives you the power to set up your own offsite replication with a simple point-and-click management system. And the cost is very reasonable. Simply purchase a one-time license for each ReadyNAS and you’re set. And when you need to scale to more locations, just purchase additional licenses as needed. The cloud-based central management system allows ease of management of all replication jobs from one location. Whether you’re scheduling a simple replication job between two ReadyNAS or you’re monitoring the consolidated view of status for all the jobs from your remote/branch offices, you’ll use the same intuitive Web UI. And if and when disaster strikes, just set up a restore job to the same or a replacement ReadyNAS. The restoration can occur across the WAN or on your LAN. And with built-in versioning support, you can revert to any saved snapshot from the past and choose to restore the entire system or fine-tune your restoration down to just a single folder. Imagine the convenience of that when a virus attacks your company data. Download the NETGEAR RN00RPL2 Datasheet (PDF).